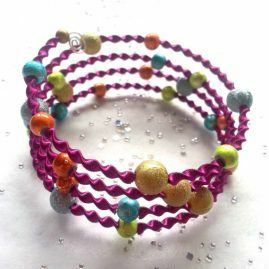 Handmade cuff style memory wire bracelet, due to its open cuff design one size fits all so perfect as a gift for her / gift for ladies if you are unsure of size. Suitable for everyday wear or to dress up an evening outfit. Each one has been handcrafted using carefully selected beads which have a beautiful blend of colours mixed with Tibetan silver plated spacer beads. They all come in a pretty organza gift bag and make great stocking fillers or secret santa gifts.